I have bought a house in San Diego. I'm also going to start putting up guest posts by Ted McGinley. This (the house buying part) shouldn't be a huge shock for people who've been reading the site of late, because I've talked a lot about how it makes sense to buy in certain situations. That said, I will briefly outline my thought process here. Below you will find updated charts showing how San Diego home prices (and, further on down, monthly payments) stack up against local incomes and rents. Longtime readers know that I consider the price ratios to be absolutely fundamental to determining whether housing is fairly valued. It makes intuitive sense that home prices would tend to track incomes and rents: incomes, because they determine how much money people have available to pay for housing; and rents, because rent prices reflect how much San Diegans are willing and able to pay to put roofs over their heads when there is no speculative or investment element involved. The historical record bears out this intuitive logic, as San Diego's home price-to-income and price-to-rent ratios have tended to be strongly mean-reverting over time. Of course, there are other factors to take into account, such as employment trends, rates, and divergences between the various sub-markets that make up the aggregate numbers. But these ratios represent a good starting point in determining where the market stands from a valuation standpoint. 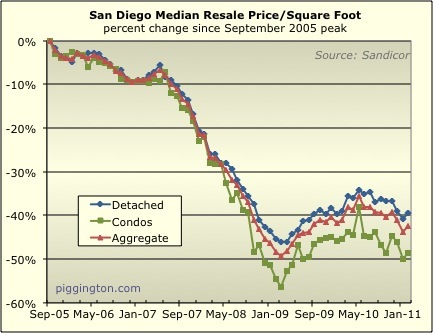 The first chart shows the ratio of the typical San Diego single family home to San Diego per capita income. (Median household income would be better but there's less data available -- however, having charted the data that is available, there is actually very little difference in the ratios whether they are based on household or per capita incomes). 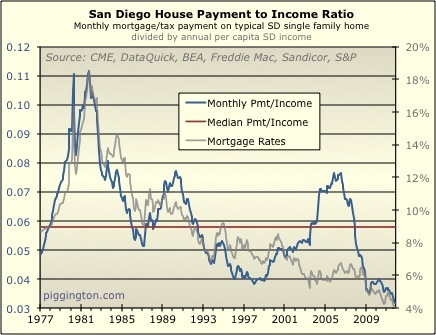 The price to income ratio is in blue, with historical mortgage rates charted in gray to provide context, and the historical median price to income ratio (what we might somewhat simplistically designate as "fair value") in red. The median price per square foot of San Diego resale homes took a bit of a hit last month, down 2.5% for single family homes, .3% for condos, and 1.9% in aggregate. 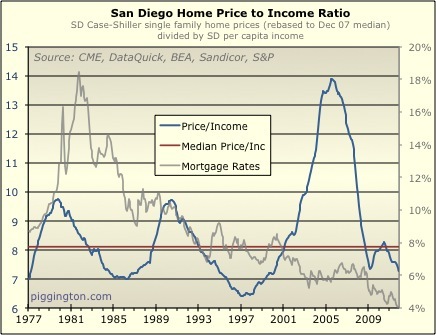 (The single family home price series is tends to give a more dependable read on the state of pricing power). On a year-over-year basis, the median price per square foot was down 8.9% for single family homes, 4.4% for condos, and 7.5% in aggregate. 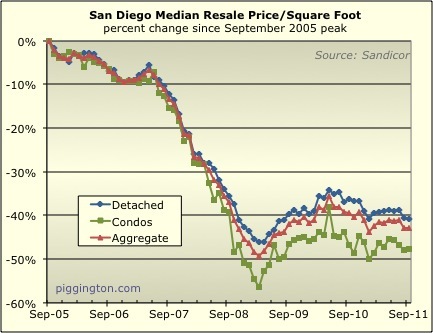 August 2011 Resale Housing Data Rodeo - With Words! Well, I didn't say the words would be interesting or anything. But there are some. The median price per square foot took a bit of a hit last month, falling for both detached homes and condos and down about 3% overall. A chart-only edition of the July rodeo follows below. Summary: prices very flat in the aggregate, but months of inventory creeping up a bit. ...the months-of-supply figure has been remarkably stable and rests at a level that probably precludes much in the way of downside. 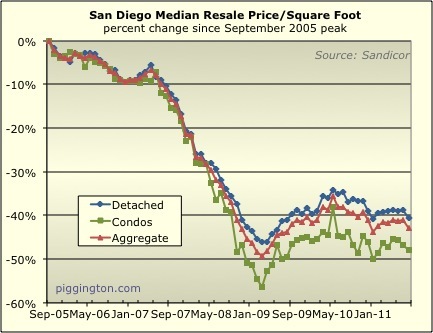 The median price per square foot of San Diego resale homes was somewhat mixed last month: up .2% for single family homes, but down 1.7% for condos, and down .3% in aggregate. Remember when housing started to falter back in 2006, and the mainstream economists' version of bearish tough talk was to predict that prices might just go up slightly less quickly in the future? "Get used to it--the seller's market is closing up shop." "Now the question is more how hard is it going to land..."
The median price per square foot for San Diego homes rose for the second time in a row in March. 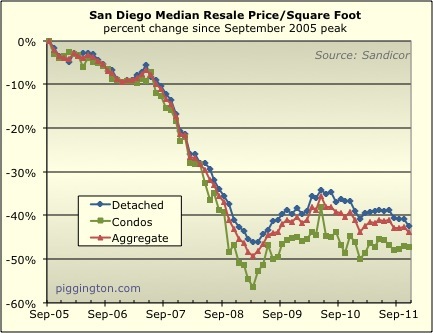 This price measure was up .3% for detached homes, 4.8% for attached homes, and 1.6% in aggregate. The detached home series is the most reliable of the three, so any actual price increases were probably muted -- nonetheless, prices look to have increased for a second month in a row.